Quick update on the Rangers. I've decided to paint them in an autumn theme. 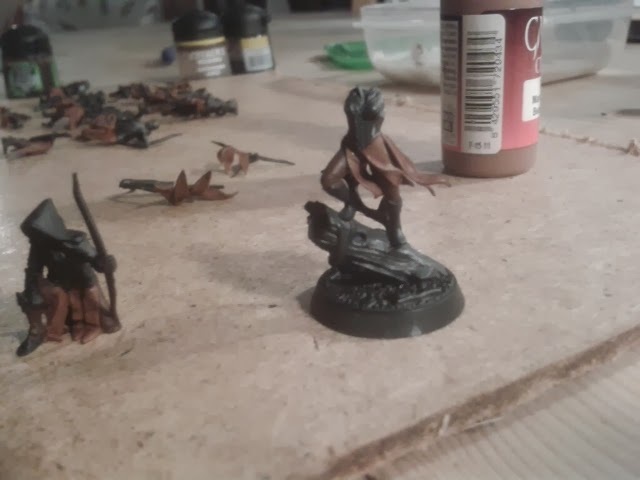 I was inspired by the idea in the new rule book, although less so by the actual painting. Anyway, it's been all about the browns so far. Trousers charred brown highlighted with dark flesh and skirts beastly brown and washed with a flesh wash. These models are so detailed that I'm having to be quite strategic in how I paint and assemble them otherwise I can't get the brush to all the parts. 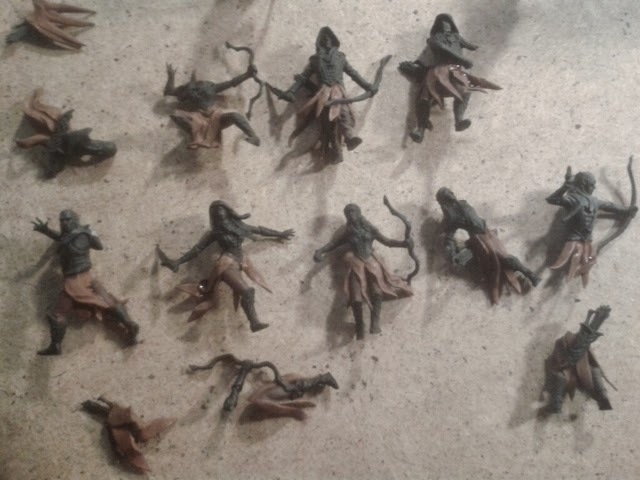 Getting them off the sprue was hard too, and notice that they don't have tabs for slotta bases. I've also committed to a the Backlog Reduction Oath on the One Ring. Last year I managed to paint 134 painted for 97 bought. I've only painted 932 out of my 1341 LOTR minis so I have quite a lot to catch up on. Sadly a lot of my back log are cavalry. I hate painting horses! So far this year I have completed 14 minis, which is a bit cheap because they were almost finished before Christmas and then holidays took over. Still I'm counting them! I think I need to sign up to that oath this year...! It's going to be a good challenge. The difficulty is the points are scored on a monthly basis. I'm off to a wargames show next month where I will probably make most of my purchases for the year. I'm going to have paint like mad in Feb to keep up!